We invite you inside an enclave of Access and Escape. Directly connected to Bellagio, this breathtaking non-gaming, non-smoking, all-suite hotel and spa delivers exceptional experiences with a sense of familiar pleasures. Access everything Las Vegas has to offer; escape everything Las Vegas has to offer. Book Online for Best Vdara Rates! Fashioned by some of the industry’s top interior designers, the suites at Vdara™ are a well-appointed blend of modern sophistication and elegant styling surrounded by the latest high-tech amenities. Every comfort has been provided; plush pillows, luxury linens, spacious bathrooms, gourmet kitchens, expansive views of the surrounding mountains, CityCenter or The Strip. For the most discerning guest, our seductive boutique hotel is as comfortable as it is stylish. 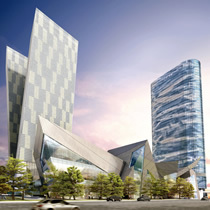 Located adjacent to Vdara, CityCenter’s extraordinary retail, dining and entertainment district will open in December 2009. Combining dramatic architecture and design with exclusive offerings from the world’s most elite brands (Louis Vuitton, Tiffany & CO and Ermenegildo Zegna among others), Crystals will soon become the premier international shopping destination. This canopy of unprecedented brilliance wouldn’t be complete without dining concepts from internationally renowned master chefs, including two innovative new concepts from Wolfgang Puck. Executive Chef Martin Heierling, who created the critically acclaimed Sensi™ in Bellagio®, is expanding his culinary creations across cultures with Silk Road. 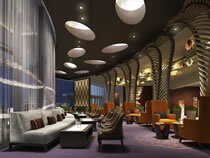 With a taste of eclecticism, the colorful space will be a mix of contemporary seating and sleek private dining booths. A sculptural partition that flows from the lounge will cascade warm light, filling the room as the day evolves, from fresh, vibrant and energetic; to alluring and intimate at nightfall, flirting with all the senses. 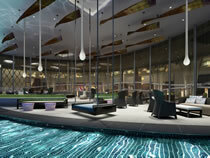 This glowing jewel box, in the center of Vdara, will radiate sophistication and surprise. Inspired by nature, this is a setting that works as well for a morning espresso as it does for a late-night cocktail. Whimsical touches, like outdoor swings, light-enhancing sculptural screens and a curved reflecting pool add to the inviting, luxurious and playful nature of the space. Guests and visitors alike are bound to find new and interesting surprises inside and out. Surrounded by cutting-edge design, world-class DJs, private retreat and spa cabanas with semi-secluded plunge pools, the Sky Pool & Lounge will be a man-made marvel where the experience is heavenly. Rising above Harmon Circle on the rooftop of the grand entry, this interactive space will provide phenomenal views, made-to-order cocktails, appetizers, and gourmet tapas; it’s an intimate and playful experience unlike anything else on the Las Vegas Strip. Where indulging has been elevated to an art form, Vdara Health & Beauty™ is a 18,000 square-foot, two-level spa, salon, fitness center and Champagne Bar located on the second and third level of the hotel. Experience personalized services and specialty treatments in a warm and inviting environment. Additional amenities include luxurious men's and women's locker rooms each boasting a sauna, eucalyptus steam room and hot plunges. The Spa Boutique carries a discerning selection of products that support the spa lifestyle including wellness books, bath & body products, skin care, cosmetics, hair care, sun care and apparel. Vdara’s exceptional and intimate service extends to the meeting spaces–specializing in smaller groups from 10 to 400 guests. Meetings held at Vdara will be handled by our experienced staff, in spaces designed with nature and flexibility in mind. Over 10,000 square feet of ground-level conference space provides a convenient setting for incentive meetings, general sessions, or food and beverage gatherings. The only thing planners have to think about is what they would like our award-winning chef to put on their customized menu.